For those interested in staying dry, the canopy top zip line adventure is available as a trip in itself. 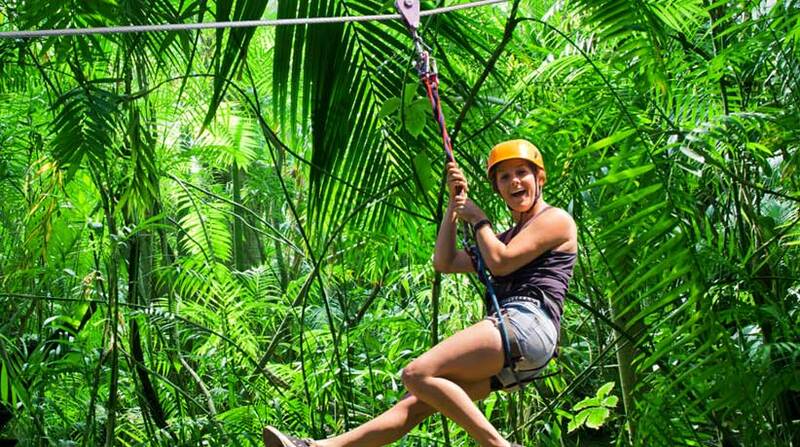 Located in the Jaguar Paw Rain-forest, zip lining is as close as you can get to flying over the jungle. As you soar from tree to tree, experience a bird’s-eye view of the Belize jungle and the winding Caves Branch River. A licensed tour guide will securely fasten you to a harness that is attached to a cable. With a slight push from a platform up in the trees, zip at your own pace through the Rain-forest. If you’re not comfortable with heights, don’t look down! Remember to wear long pants (so that the armrest does not mark your leg), bug spray, sun screen, water, and camera. Zip Lining is usually combined with Cave Tubing. Travel to Jaguar Paw and enjoy a mixture of nature, wildlife and Maya History. Tours include: Lunch, Transportation, Guide, Entrance Fee, Bottle Water, Soda, Tours Equipment. Sign Up for Cave Tubing Today!